Yesterday I went and sailed my Laser on my favorite New Jersey lake, Spruce Run. It was a gorgeous sunny fall day with winds of 15-20 knots. To be honest, the fall colors in New Jersey are now a little past their best, but even so the rolling hills of Hunterdon County were all shades of orange and brown and it was delightful to be able to enjoy the views from the water. I practiced for about 90 minutes and worked on all the faults that my coach in Minorca pointed out to me. It takes a while to break old habits and establish new ones at my age. Still, I'm making progress. There were a few other boaters pottering with their boats on the land. Mainly packing them up and removing them for the winter. For some reason, many sailors seem to think that the season is over just because the temperature is dropping below freezing at night. Weird. And not a single one of those other boatowners thought of taking their craft out for a late season spin around the lake. I had all 1290 acres of water and 15 miles of shoreline to myself. One little Laser blasting around the lake on a Monday afternoon in perfect sailing weather all on its own. On the way home, I played the Beatles' Revolver album which, with the benefit of hindsight, is now ranked my many critics as their best recording ever. It's certainly very evocative for me being released in the summer of 1966 as I was heading off for college. From that blistering guitar solo on the opening track Taxman (played by McCartney even though Harrison wrote the song) through to the final trippy track Tomorrow Never Knows with its sitar and backwards guitar track and god knows what else, it sure is a classic. That final track was playing as I arrived home and as always it reminds me of another superb autumn day, this one in 1966, crowds of students in the street, the song blasting out on massive speakers, and sniff sniff... is that smoke what I think it is? Aahh -- the sixties. What it was to be young. But it's even better being a retired baby boomer with a sailboat. Living slow and sailing fast on a Monday afternoon. You should try it. I spent ninety minutes driving to the yacht club. I waited around for an hour until the PRO decided that it was too windy for us to race. It was blowing 20 to 25 knots, gusting to 35 knots, with an offshore wind and an incoming tide. I phoned my son and learned that his Laser fleet in Boston had also cancelled racing. I spent ninety minutes driving home from the yacht club. I had a beer for lunch. I went for a walk with Tillerwoman on the trails in the woods above our town and pondered the fact that a woman had been killed doing exactly this, exactly here, a year or so ago on a similarly windy day when a branch from a tree fell on her head, and pondered the fact that going for a walk in the woods with my wife is statistically more dangerous than sailing a Laser in 35 knots. I pondered the fact that I had been out sailing a Laser in Menorca a couple of weeks ago in exactly similar conditions and had had a blast. I pondered the fact that the Aussie Laser sailors go out and sail in these conditions and pondered that this might be one reason they do much better than American Laser sailors at international regattas especially when it's windy. Thanks to Cherie of Where's Cherie? 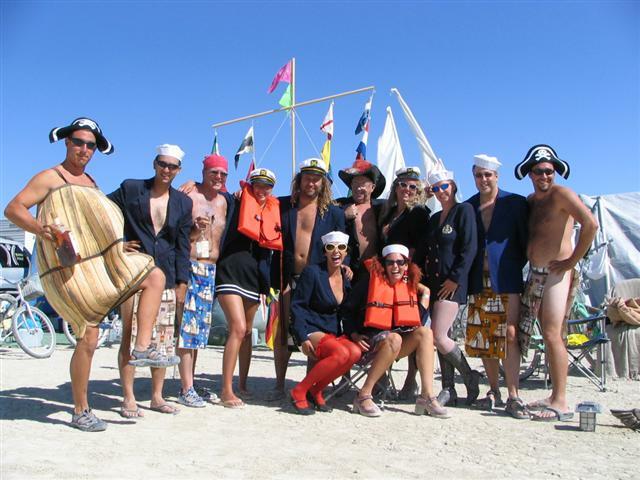 for drawing our attention to the Burning Man Yacht Club, a group of desert-loving sailors who joined more than 38,000 other "burners" at the annual Burning Man festival in Nevada's Black Rock Desert this year. For one week sailors chugged grog while land-yachts floated across Nevada's mirage dusted horizon like prehistoric ships. The Burning Man Yacht Club founders wore traditional blue blazers while handing out sailor hats and yacht club membership cards to new members. Full story here and more photos here. SE WINDS 25 TO 30 KT...BECOMING SW IN THE AFTERNOON. GUSTS UP TO 45 KT. SEAS 3 TO 5 FT. RAIN. VSBY 1 TO 3 NM. SW WINDS 25 TO 30 KT WITH GUSTS UP TO 45 KT. SEAS 3 TO 5 FT.
W WINDS 25 TO 30 KT WITH GUSTS UP TO 45 KT. SEAS 3 TO 5 FT.
Having spent three weeks in Europe followed by a much-needed granddaughter fix last weekend, I've missed the first three weeks of our Laser frostbiting season. The weather forecast for Sunday is shaping up for an awesome day: 25 to 30 knots with gusts up to 45 knots. My buddy has asked me to bring along his Radial mast for him - could be a wise move. My son just called to say his Laser fleet in Boston is thinking of calling off their regatta, much to his personal disgust. I'm psyched - even though last year in my first race of the season with this fleet I suffered a broken neck. Now where did I leave my drysuit after last winter? Who is that guy? What is he saying? I hate these blasted Laser sailors? How can he keep the boat upright in these winds? What's that he says? Something about wipers? Oops. Ignore that paragraph. My writing coach says that you should put things in logical order and not confuse your readers (and not use "you" when you mean "I") so let me start this story at the beginning and not the end. It all started a month ago when we visited our 10-month-old granddaughter in Massachusetts for a couple of days before heading off to Europe and our trip to Minorca Sailing. Someone had given her this fantastic book by Paul Zelinsky based on the children's song Wheels on the Bus. The book is an amazing feat of paper engineering with wheels that go round, doors that open and shut, babies whose mouths move when they cry, windshield wipers that really swish, and so on, plus a few visual sub-plots not in the original song. I started reading my granddaughter the book, and singing her the song, and as so often happens with kids that age she loved to look at the book and hear the song over and over and over again. So the dotty song was still going around my head when we arrived in Menorca. Then one windy day in the first week we were hanging out at the beach after lunch and a crowd of sailors was discussing what boats they were going to sail in the race that afternoon. RS 800? RS 700? 59er? 49er? One rather timid fellow looked at the whitecaps on the bay and told the crowd that he would probably race in a Laser Stratos. 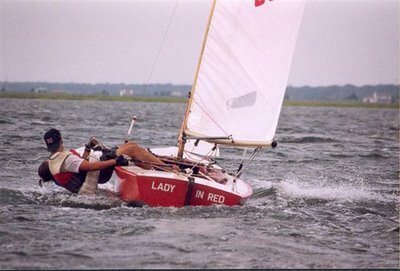 Later on in the holiday I was out racing in a Laser on a day when the wind was really honking and there were boats capsizing all over the bay. By this stage of the vacation I was pretty comfortable with the heavy stuff and I was having a blast hiking like a lunatic and torquing the boat through the waves. I was having so much fun that I started singing that annoying song again. I sang it as I cruised past capsized boats. I sang it as I lapped Radial and 4.7 sailors who were in the same race as me. I sang it upwind and downwind. Above the noise of the wind and the waves my fellow sailors couldn't exactly hear what I was shouting. They just looked puzzled. Or stared at me as if I had gone crazy. The weird thing was that the more I sang the better I sailed. I stopped worrying about whether I would wipe out on the next gybe, or thinking about how much my quads were burning, or trying to calculate whether some asymmetric sailing downwind at a weird angle would cut me up, and as a result I just relaxed. I was on automatic pilot as I sang the dopey kid's song at the top of my voice. So if you go to a Laser regatta next year and hear some funny-looking old guy singing something about buses and drivers and wheels... it will probably be me. Just smile as I overtake you. There were a few days on my recent sailing jaunt in Minorca when it was blowing around 20-25 knots with gusts in the 30s. Sadly I have no pics of the action there. 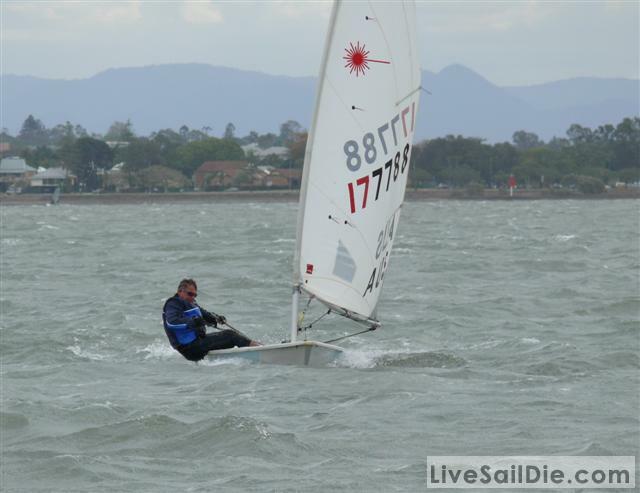 But the conditions were similar for the Queensland Metropolitan Championships last weekend and there are some photos of that event on the Laser Forum and even more in the gallery at Live Sail Die. There's also a write-up on the racing at Split Tacks. According to the class website it is a lively, hard chine, non-spinnaker, 16 foot double-handed racing sailboat weighing 260-295 lbs. and with a sail area of 140 sq. ft. The Comet carries a sloop rig (mainsail and jib), the mast stands 20 feet 5 inches above the deck and is supported by a fully adjustable three stay rig. It was designed in 1932 as a sort of junior version of the Star. 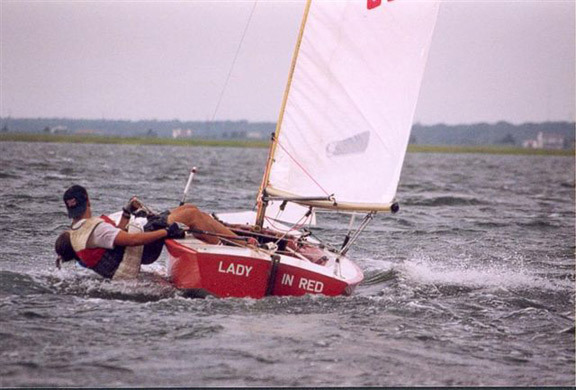 Most of the currently active fleets are in the North-Eastern United States and the 2003 North American Champions were one of my Wednesday night Sunfish racing buddies, Bob Griswold, and his wife Katha. No wait, this is a Comet. According to the class website it is a single-hander with an unstayed mast. It's 11 ft. 4 in. long with a sail area of 70 sq. ft. and a hull weight of 110 lbs. Most of the active fleets are in the southern parts of England and Wales and in the Midlands. Wait a minute what's going on here? 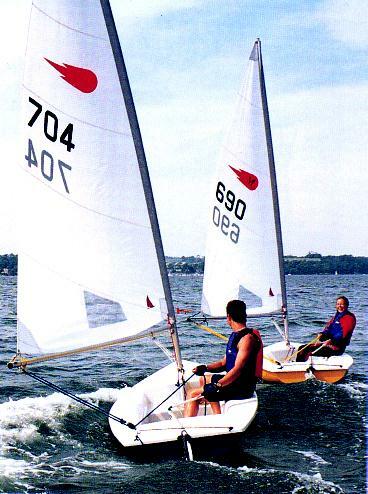 Two completely different sailboats have the same name? How bizarre. Yes, the tall guy in the picture underneath the pointing arrow. Let me explain. 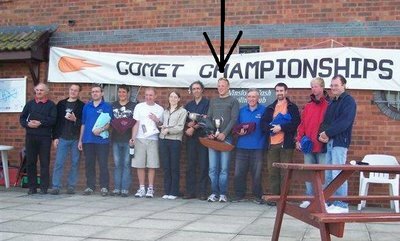 The tall guy's real name is Ian Coppenhall and he is the 2005 and 2006 UK National Comet Champion (the single-handed Comet not the junior Star style Comet). 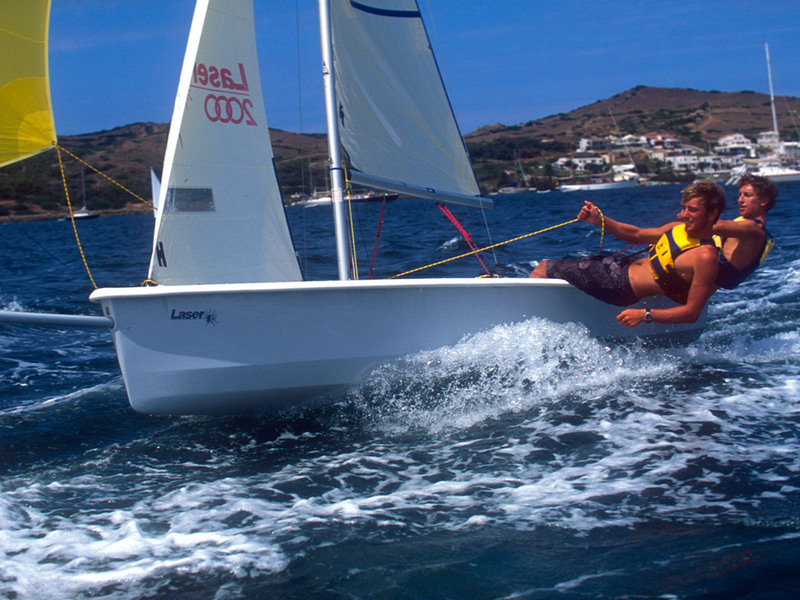 Ian worked much of this summer and early fall as a sailing instructor at Minorca Sailing. 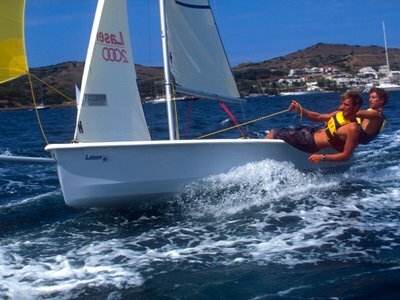 All of the instructors at Minorca Sailing are known by their first names or nicknames and as they already had several Ian's, Ian Coppenhall is known there by his nickname of Comet. Comet - the sailing instructor, not the UK single-hander or the US double-hander, was the instructor of the advanced Laser group during my first week at Minorca Sailing this year. Yeah - been there - done that. But Comet was different. He took the time to follow along behind me in his RIB while I was sailing the Laser on different points of sail and in different wind conditions. As ab says, once you've mastered the basic skills, it's relatively small things that you need to improve. Comet took the time to watch me closely and tell me about those minor faults in technique. Just what I needed. Thanks Comet. "So much effort to go so slow." That was the put-down about Laser sailing that I heard at lunch one day in Menorca. The guy dissing Laser sailors was a somewhat overweight guy who had been sailing in the advanced asymmetric group all week. We had started chatting over a beer one lunchtime and when I told him that I was in the Laser group that was his response. Hmmm. I suppose he has a point. 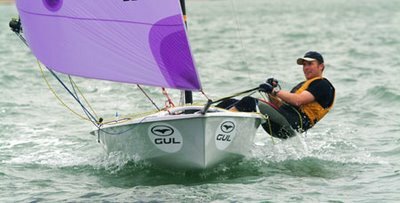 The Laser is a boat that demands a fair degree of athleticism if you want to sail it well and, judging by the Portsmouth Yardstick handicap ratings, most of the asymmetric classes at Menorca Sailing are nominally faster than a Laser. At this point in the holiday I haven't yet tried out any of the asymmetrics so I have to assume that the comment is correct. I'm not sure at first whether to be annoyed or proud. I'm sure my obese friend means the observation to communicate his superiority in choosing to sail a boat that goes a little faster with a lot less work. On the other hand, one reason I choose to sail a Laser is that I actually enjoy the physical demands of the boat and maintaining the fitness level that is required to sail the boat well. I look again at my drinking companion. Hmmm, this guy is seriously overweight. Reminds me of the fat boy in our class at school. Probably couldn't sail a Laser even if he wanted to. You don't see many overweight people racing Lasers regularly even thought there is an annual regatta in Bristol, Rhode Island called Fat Boys. Wonder what this guy does for a living? Being British we haven't yet asked the question that Americans would ask in the first ten seconds of an encounter with a stranger, "What do you do?" Brits don't do that. Poor guy has a face that just drips with arrogance and contempt. Probably can't help it but that's just the way he looks. Supercilious. I can just see him in one of those old-fashioned judge's wigs. Do they still wear them in British courts? Yeah that's it, he must be a judge. I can just imagine myself quaking in my shoes in the dock as he wags his finger at me and in a solemn voice pronounces, "You have been found guilty of the despicable crime of sailing a slow boat. I sentence you to thirty years of penal servitude. Bailiff take him away." I snap out of my daydream. Geeze, this beer is stronger than I thought. Out on the racecourse that afternoon it's blowing 20-25 knots with gusts in the 30's. The asymmetrics start 3 minutes before the Lasers but by the end of the first lap I'm catching up with the tailenders of the asymmetric fleet. Man, it feels good to be sailing a Laser in this weather. On the second lap I catch up with Fat Boy sailing an RS Vareo near the end of the second reach. He's struggling to keep the boat flat in the gusts and he hasn't even dared to hoist the spinnaker. He broaches and almost capsizes. Another gust and he's over. Ha. I know you didn't believe all that stuff I wrote about how Minorca Sailing hasn't changed in twenty five years. Well you were right. It has changed in some respects. But only for the better. Of course the boats have changed in 25 years. Currently they have Optimists and Picos and Lasers and a whole range of asymmetric classes built by Performance Sailcraft Europe (marketed under the Laser brand) and by LDC Racing Sailboats (the RS range) plus a few others. Check out Minorca Sailing's website for the current list of equipment. Many of these boats didn't even exist in 1981. And, by the way, for readers outside the UK, many of them are almost unknown outside of Europe. The structure of the sailing program has also changed. Back in 1981 as I recall there were beginner lessons but once you had learned to sail you were pretty much on your own and were free to choose a boat and just go sailing. Formal racing was organized once a week. And if you wanted a lesson in some specific skill - say using a spinnaker or trapezing - an instructor would be available to help you. There were some organized trips - to the island for a barbecue, to Fornells for a snack, and weather permitting a sail out of the bay on the open sea. But apart from beginner classes there wasn't much other formal group instruction. However when I arrived for the briefing on the beach on the first morning of this year's vacation we were offered a large range of group classes to attend. There were learn-to-sail and refresher course in Picos, basic and advanced Laser groups, basic and advanced asymmetric classes, and so on. These groups met every morning usually for a short class on the beach on some topic and then out on the water for group drills and practice all morning. Then in the afternoon there was racing for asymmetrics and Lasers for anyone interested, or continued group instruction for those who preferred that. After the afternoon racing was over, there was the option for "one on one" sessions with an instructor on any boat or any skill on which you wanted too work. It sounds very structured and, in a sense it was. Most people chose to sign up for one of those groups and stuck with it all week. The groups hooked you up with sailors of similar interest and skills to sail with, and also helped develop social contacts for the all-important dining and drinking in the evenings. But if you felt like doing your own thing and just taking a boat out for a spin around the bay that was OK too. There was also a lot of flexibility within the groups, especially in the afternoons when some members of a group might want to go off and race. But when the wind picked up to 20-25 knots on Thursday I went back to the advanced Laser class for some starting practice and for the afternoon regatta. In line with the second week theme of trying to learn some new skills I also took the evening classes on Introduction to Windsurfing for Dinghy Sailors. I must admit I didn't have high hopes, having twice before tried and failed to learn to windsurf. And by "failed" I mean failed to even stand up for more than a few seconds and on one occasion even broke my (expensive prescription) sunglasses when awkwardly falling off, or more precisely, face planting on to the board. But this time it was different. In three short beginner windsurfing classes I mastered the skills of standing up, raising the sail, reaching, steering, tacking, beating, running and gybing. Yeah - I'm a windsurfer now. Don't know if I will do it again or quit while I'm winning. Time will tell. Thanks anyway to Minorca Sailing. If you can teach an old klutz like me to windsurf you are doing well. Now what classes of single-handed asymmetric spinnaker boats are available in the USA so I can use some of my other new skills? On the last day of our vacation in Menorca, Tillerwoman and I had lunch in the Ses Salines restaurant near our hotel. As we enjoyed our grilled scallops washed down with a bottle of Mallorcan wine we had a superb view of Fornells Bay where Minorca Sailing operates its sailing holidays. There were few clients out sailing at lunch time, especially as most of us were leaving that afternoon. But there were several instructors on the bay playing with some of the more advanced boats. Even after two weeks in this idyllic spot, Tillerwoman and I still couldn't quite yet believe that so little had changed in the twenty five years since we first came here. Our vacation was nearly over and we both had warm memories of our experiences of the previous two weeks. She had hiked and painted and knitted and lazed by the pool. I had sailed and sailed and sailed and sailed. I had tried to improve some old skills and learned a few new ones. I had sailed in group lessons, and done a lot of racing, and also just cruised around the bay soaking up the vibes of this special place. When we decided to revisit Minorca Sailing after such a long absence we were almost prepared to be disappointed. Nothing ever stays the same for twenty five years surely? We didn't know what to expect. Would the environment be spoiled in some way? Over commercialized? Would Minorca Sailing have lost the magic formula that had hooked me on sailing a quarter of a century ago? No - nothing much had changed. And what had changed was only for the better. We were reassured to some extent the night we arrived in Minorca. At the welcome party for the new guests I was pleasantly surprised to see that the same guys were running the place. Bob Jelfs, the owner of the company, was on hand to welcome us all. And Tim (last name unknown to me) who was the head instructor in the early 80s was still there as the sailing centre manager. We all looked a bit older but I think they had worn better than me. I greeted Tim like a long-lost friend and told him a story about the "day you almost killed me". It was a scary windy day on our 1981 trip and all sailing was cancelled except for "joy rides" with instructors. Tim took me and some other beginner out for a blast in a 470. Somewhere on the other side of the bay we capsized and I ended up underneath the turtled hull, trapped there with the tiller through the strap of my buoyancy aid. Moment of panic until I realized that there was air inside the hull and I wasn't going to drown immediately. Tim surfaced outside the hull, counted heads in the water and concluded he was one short. He dived under the hull, found me trapped there and was about to cut me free with a knife when somehow I managed to free myself. Surprisingly Tim remembered the incident. 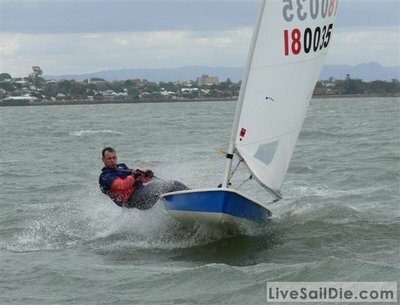 I guess sailing instructors do remember the day they thought, if only for a second, that they might have drowned a client. As the holiday progressed I began to appreciate what Bob and Tim's continuity of leadership had achieved. The boats may have changed; there may be more clients now; but the spirit of the place is the same. 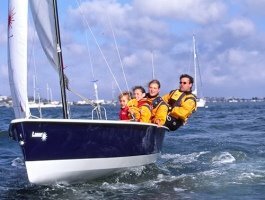 A safe sailing environment where the guests are offered a huge range of options. Something for everyone from total beginners to aggressive racers. Casual fun atmosphere with professional help and instruction if you want it, but with plenty of freedom and flexibility to do what ever turns you on. Adding to the feeling of being in a time warp was that Fornells Bay itself has hardly changed since our first visit in the early 80s. Yes, the village of Fornells has expanded a little but the new buildings are in the local style and blend well into the landscape. The hamlet of Ses Salines where Minorca Sailing is based now has two restaurants instead of one, better roads, but is otherwise much the same. Walking into Hotel Port Fornells it was like coming home; same family running the place; same friendly service and laid back atmosphere. And best of all there is that scenic unspoiled bay with the islands in the middle; the wild, deserted eastern shore; the sheltered sailing waters with hardly any boat traffic apart from fellow sailors; still breathtakingly beautiful just as we remembered it. We finished our scallops and our wine, went back to the hotel to pick up our bags, and headed off to the airport and the trip home. But we will back. Why is that when a friend or colleague returns from a couple of weeks' vacation (holiday for Britspeak readers), they are always obliged to report on their trip in the most glowing terms? Fabulous mate. Best holiday I ever had. Superb weather for two weeks. Great food. Met lots of interesting people. Fantastic scenery. You really have to go there. Is it because nobody ever wants to admit that they just blew five grand on a totally miserable experience? Or is it some subtle kind of one-upmanship to prove one's superior ability to discover the world's best vacation spots? In any case, having announced my trip in advance, I feel obliged to report to regular readers on my return to Minorca Sailing for the first time in almost a quarter of a century. And if I were to observe the above-mentioned convention I would have to tell you that the weather was absolutely perfect for sailing; the instructors were competent, flexible and friendly; the bay and the village were almost unchanged in 25 years and were as peaceful and scenic as ever; the range of boats available was amazing; and that Tillerwoman and I had one of the best vacations ever. 1. One day it rained a bit while we were sailing. It was blowing 25 knots so we were all soaked through anyway but, hey, how dare god make it rain on my holiday? 2. Another day it rained a bit just as Tillerwoman and I were going into a restaurant for lunch. It stopped before we finished lunch. Ditto on the god comment. 3. Once I was just leaving the beach with a Laser when the pin attaching the vang to the mast came out. It took me all of two minutes to fix it. 4. Another time I death rolled a Laser. Must have been Minorca Sailing's fault of course. 5. At one restaurant I ordered sea bass with fennel for dinner but the waiter said it was off so I had to have sea bass with basil. Well yes it was excellent, but there's fennel growing wild all over the damn island so how can the fennel be off? 6. Another day at another restaurant I order the red mullet with black risotto and Menorcan cheese but the mullet was off and I had to have turbot. That's two times in fourteen days that the menu was wrong. How incredibly unprofessional. 7. One night there was a mosquito in our room. 8. Tillerwoman got up at 2:30 in the morning and started jumping up and down and waving a towel around to try and kill the mosquito. Tillerwoman was more annoying than the mosquito. All right I admit it. It really was a great vacation. Dinghy sailing heaven. But keep it quiet. Just between us OK? Don't want everyone to find out about our secret.